About a year ago, I switched from OmniFocus to Things, in part because of a dislike of the OmniFocus Mac app. Today, I’m switching back to OmniFocus for two reasons.1. OmniFocus 2 for the Mac was released yesterday—delivering feature and UI parity with its wonderful iPad cousin. 2. I’ve pretty much given up hope that Things 3 will be released within my lifetime. Switching from Things to OmniFocus involves a mental shift from “Projects, Areas & Tags” to “Projects, Contexts & Perspectives”—but beyond that, the transition has been pretty smooth. There was, however, one critical workflow problem to be solved—creating todos linked to Mail.app messages. Unfortunately, OmniFocus’s equivalent Quick Entry feature doesn’t provide the capability to automatically link to selected Mail messages. Being able to quickly get back to the original email message—for replying, or accessing an attachment—is critical for me, and so this missing functionality was nearly a show-stopper. In lieu of auto-fill, what OmniFocus does support is something called “Mail Drop”. If you use Omni’s proprietary system to sync your OmniFocus data, you can create a special email drop-box address. Email messages arriving to that address on Omni’s servers are automatically added as todos in your OmniFocus inbox. Those new todos are named according to the message’s subject, and have their “Note” field pre-populated with the message’s content. That’s certainly useful—and beyond just creating todos from Mail.app messages—but it doesn’t address the particular need I have to be able to efficiently get back to the original Mail messages from linked todos. As with so many challenges I’ve faced when working on a Mac, a solution was found using the wonderful Keyboard Maestro macro application. 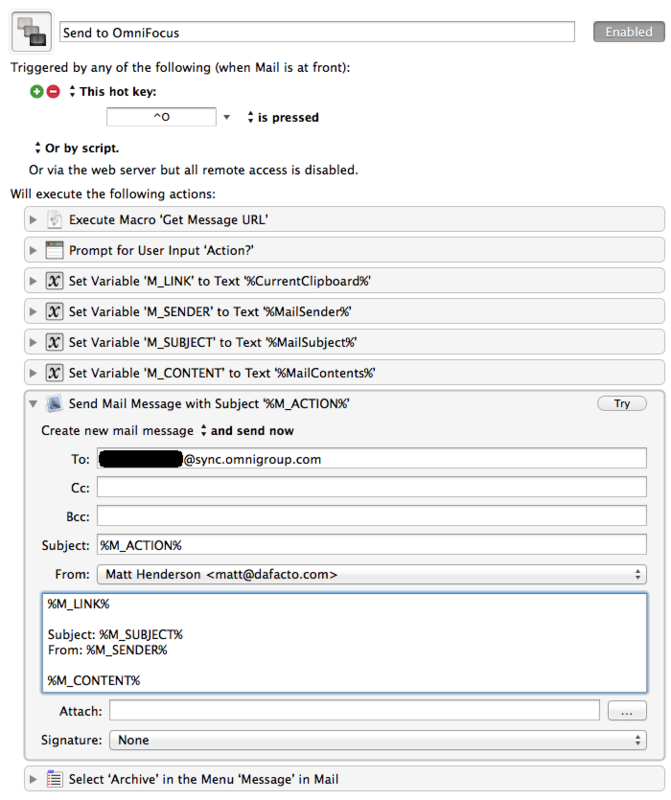 Using Keyboard Maestro, I was able to create a script that, when executed, creates and sends a custom-built email to my OmniFocus Mail Drop—and containing a direct link back to the original Mail message. Prompts me for a short text to be used as the todo title. Sets a variety of Keyboard Maestro variables. Creates an email message whose subject and body content are built from those variables—including the link to the original message—and then sends that email to my Mail Drop address. Archives the original Mail message—since at that point, I’m done with it. set _messageURL to "message://%3c" & _msg's message id & "%3e"
Shortly after the script does it job, a new todo, like the following, will appear in the OmniFocus inbox—containing a custom title, the original message’s subject and contents, and most importantly for me, a clickable direct link back to the original message in Mail. So there you have it—an elegant solution for creating message-linked todos in OmniFocus 2. I hope you enjoyed this article, and feel free to ask any questions you might have in the comments below. If you’d like to achieve the same thing without having to rely on the OmniSync server, I just posted a simpler method here. Amazing. Thanks. Do you think this could also work for the gmail or inbox web interface as well? Hi Mark, I don’t think it would work, as the approach extracts the message URL via AppleScript specifically speaking with the Mail.app.